What Can a Chromebook Do Exactly? The 5 Most Common Questions New Buyers Have – Answered. 01/30/2018 04/28/2016 by Andy Z. We often see the same common questions asked over and over about Chromebooks. These questions often entail things like what can a Chromebook do and can’t do, how much they cost, the difference between a Chromebook and laptop, are they useless without an Internet connection, how fast they are, can they run Minecraft, and more. And we’ve seen these questions on forums, articles, comments, Facebook, YouTube, Twitter, and even sent directly to us in our email. We wrote this post to go over a few common questions about them that the public seems to have a misunderstanding about them. So we’re here to give some opinionated gospel. So, this post is really just going to be a bunch of questions about these little laptops that we’ve encountered and our reply to these questions. Last updated: 5/6/17. This post keeps getting updated for the best and most accurate information you can find on the web. What can a Chromebook do? And should you buy one? Question 1: They’re literally just an over-glorified web browser with a laptop casing, right? Well, when you put it like that, it’s very much saying so a car is basically just an engine with a metal casing, right? The answer is both yes and no, but preferably a big “no.” They mainly run within the browser and the majority of the stuff you do on one will be done within the Chrome browser. The web browser can pretty much do anything in the majority of people need to be done. Chrome OS obviously runs the Chrome web browser, and you can play games, viewing images, watching videos, browse your favorite sites, and even launch some apps all within the browser. But, other than the web browser, it can also do other things outside of it. For instance, it has its own built-in photo editor, an audio player, and a video player. It can also launch apps that you can download from the Chrome web store and make them available offline. You can also use the Google Suite of productivity tools such as Google Docs instead of Microsoft Word and Google Sheets instead of Microsoft Excel- and these are also available offline. You can also reply and check your email offline. And don’t forget the apps. Lots and lots of apps. If you think about it, on a Windows laptop, what do you spend most of your time doing? Is it browsing the web? Google Chrome’s got that covered. Is it working on your business with Excel? Again that’s covered. Is it editing your resume with Microsoft Word? It’s got that covered, too. Is it playing games? It can do that as well. If you think about it, the majority of people do basic tasks to where a Chromebook offers and faster and more efficient lightweight alternative. They can do most of the tasks you do regularly on a Windows machine or Mac as well. Most apps are perfect substitutes for whatever application or program you’re used to. Of course, there are native Windows programs that Chrome OS can’t run, but many of them are making themselves available for Chrome OS. A recent example? Adobe Photoshop. Adobe has begun making a streamlined version of their product that can run on Chrome OS. And not to take the thunder away from Apple, but whatever you need to be done on it that you used to do on Windows, there’s probably an app for that. What can it do without the proper app? Probably not much. But developers are making apps for nearly all major functions so you’ll likely see an app for whatever you need to be made and released. Google is also behind their apps and constantly bringing more apps available for offline use. Google will improve the service and apps will be available for nearly everything you need- all powered by a super fast laptop at an affordable and cheap price. It pretty much does it all. So, is it really just a web browser? Not exactly. The web browser is a big part of what makes it what it is. But there’s more than just the browser. You have the apps as well. Question 2: What can a Chromebook do without the Internet or WiFi? Like we mentioned above, Google and other developers have already made a lot of their apps available offline. They have online and offline versions and Google has already started the revolution. It really depends on what you need to do when you’re offline. If you’re looking to check your email, write a document, work on spreadsheets, or play some games, all that stuff is already available in an offline version. If you’re looking to watch videos or view images random stuff like that, you can also do that all the time. A lot of that developers have already begun making all different offline versions of their apps along with online versions as well. You can even search the web store and filter by the offline availability of an app. That brings us to the point, how often do you not have internet connection in today’s modern society? Whether you’re at home at work or out in public, chances are you’ll find free Wi-Fi somewhere. The race to put Wi-Fi availability is widespread. And even modern cars have their own Wi-Fi mini tower built-in, along with buses or giant retail centers. Wi-Fi is everywhere. And if you’re really stuck in the desert in the middle of nowhere? This whip out your phone and use the Wi-Fi hotspot. We think the argument that having no internet connection means having a useless brick is invalid. It’s actually very difficult to not have Wi-Fi in modern society. Question 3: I heard that can’t attach my phone or my other peripherals. Is this true? They can easily connect to basic USB devices, such as phones and external hard drives. It used to be true, but now not so anymore. The earliest build of them had a whole bunch of problems reading the files and organizing them. But with the newer models, pretty much any Chromebook you can buy today, have ports that are built with modern standards (USB 3.0), and that can read your USB thumb drives, SD cards, and your phones. They also have a built-in file manager so you can organize your files- although it’s basic. What can you do with these files? Pretty much anything you want. You can manipulate them with the photo engine, or view them, or store them, or organize them into folders, just like you’re used to on a Windows or Mac based OS. Newer models even have USB-C ports and fingerprint scanners as well. World-facing cameras. Metal casing. Whatever you want, they’re coming out with it. They come standard with a 16 gigabyte SSD drive and aren’t meant to hold a whole bunch of your images videos or music or other media. They (Google) really wants you to use a cloud service such as Google Drive, which is why they provide you with some free goodies upon purchase of your new laptop. Google Drive is free to use and can be upgraded if you need more space. So if you need to attach a whole bunch of stuff to your device, as long as it’s something basic like a thumb drive, keyboard, or mouse, it should be fine. External hard drives work as well. And your phone too. You’ll have a basic way to organize your files after connecting a device. Question 4: What apps can they run? Apps are the bread and butter of any Chrome OS laptop. They are basically web-based applications and the Chrome web store has thousands of them. Both paid and free. Your device comes with a default set of apps preloaded in there by Google, but you can easily remove these and add whatever else you want. Or you can keep them. It makes it very user-friendly to forge your laptop exactly how you want it. You can simply go to the Chrome web store and search or filter by category, type, price, or just browse the home page and see what’s trending. With these apps, you can do a whole bunch of stuff from photo editing, reading leading publications, playing games, making movies, writing code, or pretty much anything you need to do. You can download whatever you want in app form and it can run it. You can make it do whatever you please, pretty much with apps. Take out your smartphone, and just go to your app store. There’s pretty much an app for everything right? That’s pretty much how it’s like on it, except you have it in a laptop form which makes it more productive, as we like to say. Imagine all the apps you use on your phone, but rather you can use it with a keyboard and mouse. A lot of them would be a lot easier to use right? That’s pretty much how a Chromebook is like. So you can pretty much customize it to whatever type of machine you wanted to be. Do you want to go all productivity? You got it. Did you want it to be an entertainment laptop with a whole bunch of games, videos, and stuff? You got it. So, you really have the freedom to make it whatever you want it to be. Question 5: What’s the difference between a Chromebook versus Netbook? Or even a tablet? 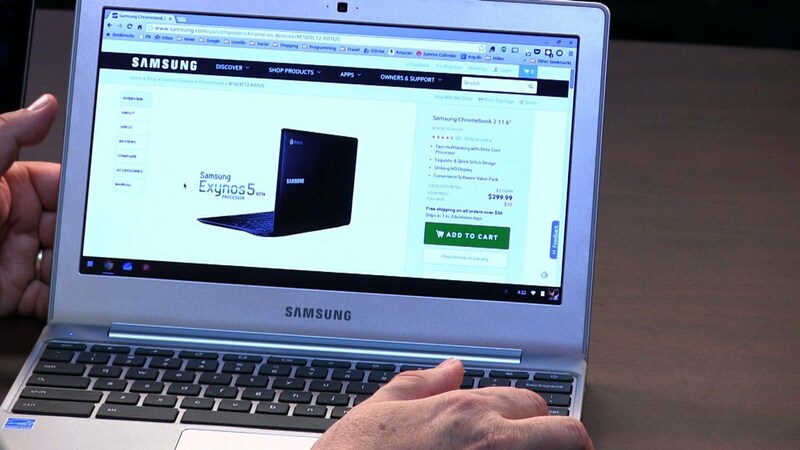 Chromebooks have an excellent keyboard and user-friendly experience vs. a netbook or tablet. Well, the obvious thing is that they run Chrome OS whereas a cheap Netbook may run a different operating system such as Android or their own proprietary OS. Chromebooks are also known to have much more user-friendly keyboards compared to notebooks, and obviously superior compared to iPads. We’re not trying to start a flame war here, but you try typing on its keyboard vs. typing on an iPad keyboard. We think there’s no argument. Of course, you can buy your own peripherals and external hardware, but we’re just talking about the default common native keyboards. Compared to a cheap netbook, they also have a super fast boot up time, some as low as 5 seconds. They beat netbooks in battery run as well. They have a very long run time on a single charge. Some models can go up to 12 hours per charge, which is impressive. They can do plenty of work- whether productive or not. If you need something portable and on and on the go, it makes the perfect companion. Compared to a netbook, it offers a much more friendly user experience and doesn’t have any of the bloat that comes with other operating systems, such as Windows. You won’t sign into your Chromebook and find all these offers, icons, and popups from random third parties pre-loaded on your system that you’ll never use, and apps that you can’t remove. Although, the Chromebook does have some preloaded apps, but they’re all from Google and you can easily remove them. Well, this about addresses a few common questions that we always get. You should have a clearer understanding of what they can do. And the real power of the laptop. The real question if you’re on the fence…is you. How comfortable are you working with a machine where you’ll do most of your web most of your work through the web browser and apps? Are you comfortable with storing most of your work into a cloud-based provider? Are you comfortable with using an alternative to Microsoft Word and Excel? Do you care about not having the latest killer specs and a beastly machine? Do you want to play the latest and most modern games? Do you need to have 16 applications running simultaneously along with 3 YouTube tabs open? Think about it. You need to address these questions and answer them yourself to see if it’s is right for you. Many people get a negative opinion because they crack open a laptop and see that it can’t do many of the things they’re used to. Don’t be one of them.